There are a lot of things that you might want to get repaired from your home. Making a checklist can be an easy solution to ensure that all minor and major damages in all parts of your home will be fixed. However, you need to be meticulous with your repair priorities because some minor damages may tend to be bigger issues than some major issues that you listed down. One of the most neglected issues when it comes to home repairs is a damaged window screen in Sterling Heights, MI. Flow of Fresh Air – A window screen repair in Sterling Heights, MI will ensure that you can have fresh air flow inside your home. Spring and fall are the best seasons to enjoy the cool breeze of your environment. You can have them inside your home without exposing your indoors to harmful elements. 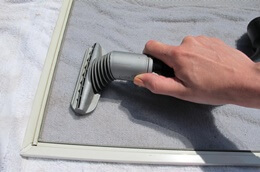 Cost Saving - Sterling Heights, MI window screen repair makes sure that your window screen is good condition to let light and air inside your home. Using natural light and fresh air coming from your surroundings will significantly reduce your energy consumption costs. Increased Value – A window screen repair in Sterling Heights, MI will ensure that your window screen continues to be an asset to your home. A well-maintained window screen adds value to any residence.